Claystation is a mass-participation format for creative experimentation. Our aim is to connect with an understanding of design process through some form of creative expression, be it modelling, animation and drawing. Claystation was devised by the Design Transformation Group as a means of encouraging normally passive audiences in active participation. It is heavily influenced by theories of play, which the creators believe is key in the development of creative thought. 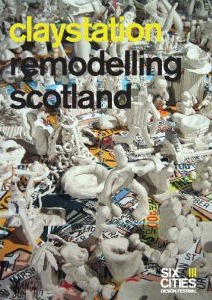 Exhibition venues have included Designers Block, London Design Festival, Block Architecture Festival, Salone de Mobile Milan, London Architecture Biennale, the Scottish Parliament and a national touring exhibition for the Six Cities Design Festival 2007. An accompanying book authored by myself describing the project was published under The Lighthouse imprint (see image above). Claystation received a Top Nomination in the INDEX: 2005 awards, the worlds largest design and innovation award. Claystation was runner up in the Play category to Apples iPod and iTunes. The accompanying award exhibition in Copenhagen attracted over 167,000 visitors during the show’s three-month run. The research project has been presented and published at refereed international conferences and received major critical exposure and recognition most notably through journal publication, review and feature articles including Blueprint, Icon, New Design, Design Report and Desktop. In partnership with Ben Hughes, I have continued to develop new methodologies and creative formats for ‘non expert’ design, encouraging meaningful consumer and audience participation in the production, consumption and interpretation of design. Projects have included My Chair originally commissioned by the National Museum of Scotland to coincide with the museums showing of the Jerwood Applied Arts Prize in Furniture and subsequently shown at the London Design Festival. My Bag commissioned by leading Japanese Luggage Manufacturer Porter International, which toured internationally to ICFF New York, Milan Furniture Fair, London Design Festival and Taiwan; and My Car commissioned by NICE an innovative electric car company.